In “The Wild One,” Marlin Brando plays Johnny, a leather-jacketed vagabond sporting a black-brim hat perched on his head at a rakish angle, below which lurk piercing dark eyes and a sneer of contempt in answer to the question, “What are you rebelling against?” Brando states simply, “Whaddaya got?” An answer like this was provided by mob leaders in 1894 during the most spectacular controversy in the history of modern France, known as the Dreyfus Affair. Similarly, in America today, the Occupy Wall Street mob screams its answer by pointing to villains held in contempt by the republic’s governing and press elites. Brando’s Johnny, the French mob, and America’s OWS drum-beaters spring from the same historical DNA that portends danger for modern civilized democracies. The “whaddaya got” of the Dreyfus Affair centered on a Jewish officer from the French General Staff who had been unjustly accused of espionage for Germany. The case dragged on for years and ultimately resulted in his acquittal by a Court of Appeal, though not without inflaming passions about the nature of French society and its constitutional order, which continued to simmer through two world wars and the postwar era. Further, as Hannah Arendt pointed out in The Origins of Totalitarianism, the Dreyfus Affair ignited the fanaticism of the mob, a disparate conglomeration of persons whose rise “had been anxiously noted by all great historians of the nineteenth century.” The mob despises the social order, has no patience for representative assemblies, and possesses considerable toleration for violence against its enemies. In France’s case, the mob loathed Jews and the country’s republican institutions. A century or so later, the theatre remains the same but the scene is now the United States, and the French connection consists of chilling similarities between the detritus of French society at that time and America’s current homegrown menagerie of misfits, radicals, and luminaries, which range from Susan Sarandon and Sean Penn to a bevy of local vagrants. The “whaddaya got” objects of rebellion for these October follies consist of the rich, Wall Street, and capitalist greed. 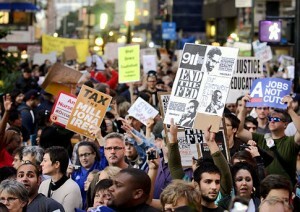 More than that, one finds protestors united in their ideological conformity, as pointed out by Douglas Schoen when his firm interviewed about 200 members of the OWS crowd at New York’s Zuccotti Park. Arendt observed that the French mob was not the French people and Schoen’s analysis comes to the same conclusion. Despite the “other 99 percent” claim on the part of various spokespeople, about half of America’s mob are professional demonstrators and about a third support violence to achieve their aims. What aims? Radical redistribution of wealth, huge tax increases on the better-off, free college education, guaranteed employment, and pretty much a life without risk; in short, a sort of left-utopian wish-list more congruent with perpetuating permanent adolescence than with advancing serious grievances to the level of grown-up policy debates. For the Obama administration, after nearly three years of railing against “millionaires and billionaires” and American free enterprise while touting a European-style welfare state, the rise of the mob must appear as a godsend. What greater fun can be imagined by America’s progressive elites than to observe the country’s déclassé malcontents fulminating against their bogeymen? Until it all gets boring, of course. But mobs are dangerous. France’s mob lingered through two world wars, contributed significantly to the demoralization of the republic, and supported the Vichy Regime in its campaign against Jews. The American mob, with its sympathizers in academia, media, and politics, will likely remain skulking in the shadows, ready to burst into action with great energy and considerable political support. We must be aware of the ominous possibility that the direction of the American republic, as was the case in France, may be influenced by the mob. Marvin Folkertsma, Ph.D. is a professor of political science and Fellow for American Studies with the Center for Vision & Values at Grove City College. He is the author of several books. His latest release is a high-energy novel titled The Thirteenth Commandment .